The White Hart | Pub Quizzers | Find a pub quiz near you, now. 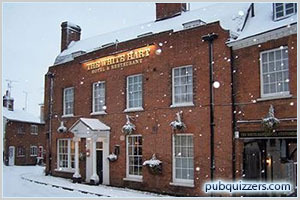 Pub quizzes take place at The White Hart, Welwyn on Thursdays (monthly) at 20:30. Entry is £2.00, you can have up to 10 people on a team. There are prizes of spot prizes, cash, drinks. Happy quizzing! Pop Music Quiz every 3rd Thursday of the month. Which sport does Costantino Rocca play?